A truly great name in British and world cuisine. 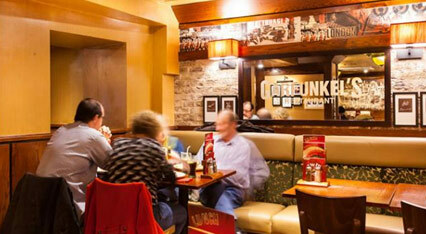 Founded in London’s West End in 1979, Garfunkel’s has become legendary! Garfunkel's Restaurant would like to say thank you for your service by offering 20% off your total food bill when you present your service ID at our restaurants found throughout London, Edinburgh and Bath Spa. Valid for you and up to 8 friends or family at one table. Please confirm with the restaurants staff to see if they offer the Armed forces disocount before ordering. Present your military / service ID to get your 20% discount! Cannot be used in conjunction with any other offer or discount promotion including set menus.